Live in session: Richard Crow, plus exclusive AAS performance recording. RHP CDRs rosta showcase. This Friday 21st March Richard Crow will perform live in session. Plus exclusive audio from AAS group’s Cult Of Possible Elements performance at IMT gallery, as part of a showcase of RHP CDRs artists. 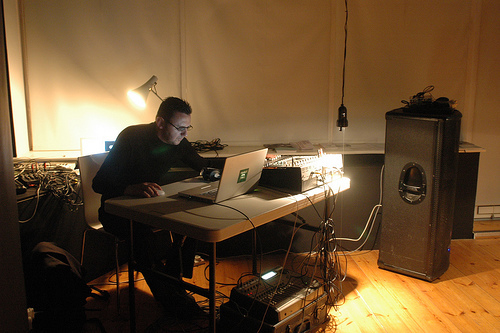 Richard Crow is an inter-disciplinary artist working in the field of experimental audio research, live performance and site-specific installation. He utilises sound and noise in a performative way, for its disruptive and subjective qualities and above all for its psycho-physical implications for the listener and viewer. Over the past two decades his solo and collaborative site-specific installations and performances have consisted of highly conceptualized interventions into base materiality, investigations of alternative systems of organisation and research into a certain material decadence, most notably with the project The Institution of Rot which he co-founded with the writer Nick Couldry in 1992.